At its April 28 meeting, the Jacksonville Rotary Club recognized the accomplishments of five area students by providing them with college scholarships totaling $9,000. 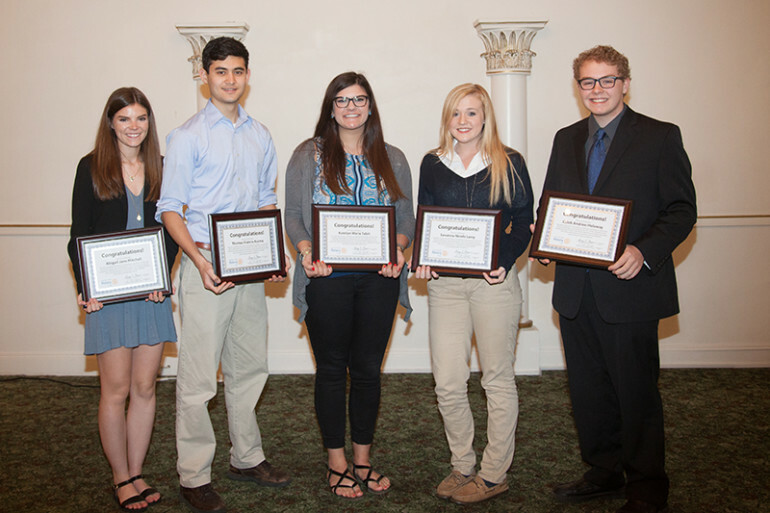 Thomas Asama, Abigail Mitchell, Caleb Holaway and Savanna Long were each awarded the $2,000 Rotary Scholarship. Katelyn Tabit was awarded the $1,000 Staff Sergeant Matthew Weikert Memorial Scholarship. This is the fifth year of the Jacksonville Rotary Club Scholarship program. The Rotary Scholarships, made possible by Rotary Club fundraising efforts, are designed to not only recognize scholastic achievement, but also leadership, volunteerism and contributions to the community. The Weikert Scholarship, founded to honor the memory of Staff Sgt. Matt Weikert, is funded by an anonymous donor and administered by the Jacksonville Rotary Club. Thomas Asama was awarded a $2,000 scholarship. His community service and leadership includes volunteering at Passavant Area Hospital in the Physical Therapy department and at the annual bazaar, serving as a swimming timer for Special Olympics, participating in the Jacksonville Campaign Against Distracted Driving, and serving as class secretary on the Student Council and president of the National Honor Society. He was captain of the track team and played first chair trumpet. Asama plans to attend the University of Iowa. He is a Routt High School senior and the son of Beth and Francis Asama. preparing care packages for military members, and cleaning and building playground equipment at First Presbyterian Church. She was the Interact Club President, DECA Club President, National Honor Society Vice President, and JHS girls’ soccer team captain. Mitchell plans to attend the University of Illinois. She is a Jacksonville High School senior and the daughter of Troy and Kim Mitchell. Retreat Center. He was Treasurer of National English Honors Society, student leader for the First Christian Church Youth Group, and co-director of the Jacksonville High School Jazz Combo, which provided entertainment for the Beaux Arts Ball, the Suicide Prevention Walk, and United Way Fundraisers. Holaway is a Jacksonville High School graduate who plans to attend Maryville University. He is the son of Julie Ketchum and Mark Holaway. Savanna Long was awarded a $2,000 scholarship. Her community service and leadership includes volunteering for the Passavant Area Hospital Team Rehab Program; Big Brothers Big Sisters; Routt Crocheting Club, which donates baby blankets to local shelters and women’s crisis centers; and Jacksonville Public Library. She is a member of National Honor Society, the Routt Cheerleading squad, and Student Ambassador Club. Long is a Routt High School graduate who plans to attend MacMurray College. She is the daughter of Sally and Wes Long. Katelyn Tabit was awarded the $1,000 Staff Sergeant Matthew Weikert Memorial Scholarship. Scholarship Committee Chair Stephen Holt said, “Katelyn Tabit is an outstanding young woman who represents the qualities of leadership and service that will appropriately honor Staff Sergeant Weikert’s memory. Her community service and leadership includes Role Models Encouraging Freshmen, volunteering at Cedarhurst Assisted Living, and the Saturday Science program. She was a member of the WYSE Academic Challenge team, National Honor Society, National English Honor Society, National Spanish Honor Society, and FFA where she served as leader of community development. Tabit is a Jacksonville High School graduate who plans to attend Illinois College. She is the daughter of Jennifer and Jamie Wilson & Brett and Gina Tabit. Holt said, “This scholarship is open to JHS seniors or alumni – including those who may be returning to school after years in the work force – who are interested in pursuing education or training through a community college or vocational program.” An anonymous donor has provided the initial funding to offer the Staff Sergeant Matthew Weikert scholarship for the next two years. The Jacksonville Rotary Club Foundation has and will accept tax-deductible donations from anyone interested in extending the scholarship’s availability. More information about this topic can be obtained by visiting the Jacksonville Rotary Club web page at jacksonvillerotary.org/scholarships.